If you read the previous article from this website, you would see that I pointed out that conservative activist John Smithson had copied this website. 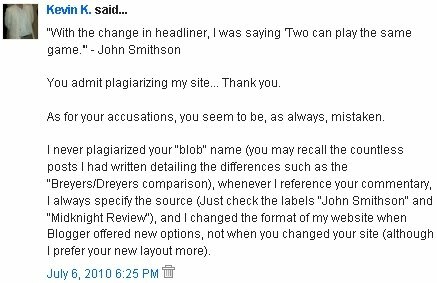 John Smithson was kind enough to reply to that article admitting to plagairising The Midnight Review. See where Smithson states that he changed the header of his site to make his "wedded" to this one? I took a screen shot of his comment for posterity. I find Smithson's confession very interesting. There is no "confession" of plagiarism from me. In fact, since my site and the name "Midknight Review" were here first, I cannot plagiarize your title at all. I do have an attorney's opinion on this but I really do not have the time to pursue this. 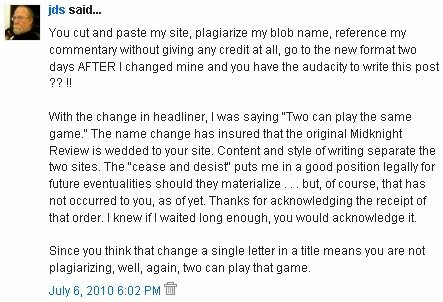 "Since you think that change a single letter in a title means you are not plagiarizing, well, again, two can play that game." You wrote that because you believe that I was plagiarizing, you yourself would plgairize to prove a point. That sounds like an admission of guilt. 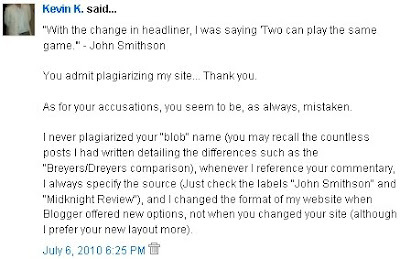 Obviously you do have the time to pursue this otherwise you would never have changed the name of your site to include "report and opinion" in the first place (as well as comment on these articles), and is this attorney's opinion the same attorney who okayed your violation of copyright law regarding your plagiarizing of The Financial Times? Is this the same source where you got your understanding of "libel" and "slander?" If you don't forget, it was you who came on this site first throwing around accusations and insults, claiming your readership was confused and that I was decieving them with my similarly titled blog. Which reader questioned my existence? Was it one of the countless commenters on your site? I'm sorry. I forgot. After flipping through your hundreds and hundreds of blog posts, I barely see any comments left behind (I think I spotted 2 excluding ones left by people who visited your site from this one), so obviously those who do visit either your blog or mine see there is no similarity. Looks like you and your attorney are the only one that have this faulty opinion, not fact.